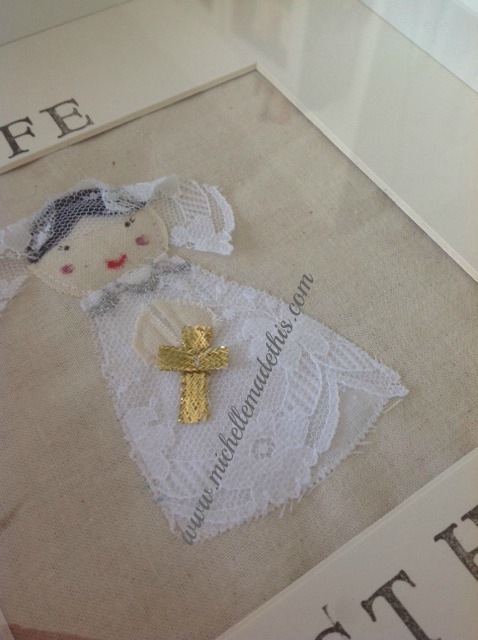 These lovely personalised gifts are the perfect keepsake to celebrate a girl’s First Holy Communion. Each frame features a girl complete with communion dress and veil in vintage lace with hands in prayer position as if holding rosary beads. The girl is created using a variety of techniques including applique and machine embroidery. Each piece is completely original as every piece is individually cut out and stitched and therefore will have its own unique look. 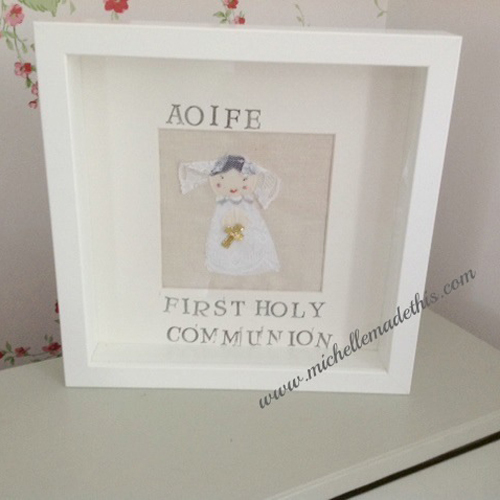 The words FIRST HOLY COMMUNION will be stamped at the bottom of the mount and the child’s own name stamped at the top. Should you wish to have more details added just let me know? Each piece comes mounted and framed in a contemporary white box frame which can be hung on the wall or sat on its side. The frame contains glass glazing and not Perspex.